Biomineralization of (magnesium) calcite and vaterite by bacterial isolates was observed using isolates from limestone associated groundwater, rock and soil. More than 92 % of isolates could form carbonates with different crystal macromorphologies. Using different conditions like varying temperature, pH or media components but also cocultivation to test for collaborative effects of sympatric bacteria, mechanisms of calcium carbonate formation were studied. We evaluated the bacterial composition and diversity of bamboo soils sampled at different elevations and incubated at different temperatures. Soil respiration was greater at higher elevation and temperature. Soil bacterial structure and diversity showed variable under different incubation times and temperatures. Increases in temperature increased soil respiration and consumption of soil soluble carbon and nitrogen, thus influencing the bacterial diversity and structure at different elevations. Temperature extremes play a crucial role for vegetation growth and vitality in vast parts of the European continent. Here, we study the likelihood of simultaneous occurrences of extremes in daytime land surface temperatures and the normalized difference vegetation index (NDVI) for three main periods during the growing season. Our results reveal a particularly high vulnerability of croplands to temperature extremes, while other vegetation types are considerably less affected. In this paper, we focus on key, poorly understood properties of carbonate geochemistry in one of the largest estuaries in North America. We explore how varying environmental factors impact estuarine inorganic carbon fluxes and seasonal net ecosystem production. Comparisons with long-term records highlight the significance of tributary inputs as well as a regional shift towards increased riverine bicarbonate concentrations. Early biogeochemical ocean models were of a simple structure, with few biogeochemical components. 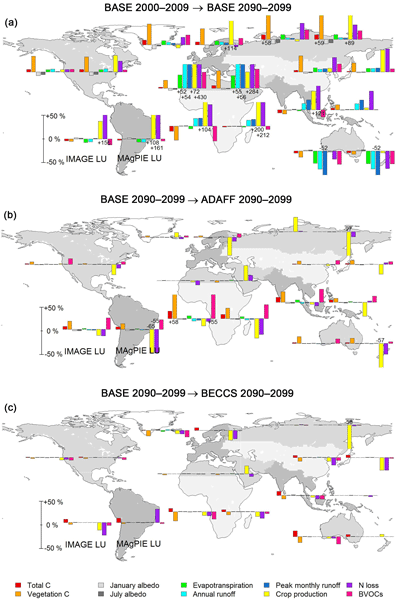 I here investigate whether additional biological complexity improves the fit with respect to observed global climatologies of annual mean nutrients and oxygen. After optimisation against these tracers a simple model fits observations almost as well as a more complex one, also with respect to independent estimates of global biogeochemical fluxes. We analyzed the relationship between terrestrial net primary production (NPP) and the rate at which carbon is exported from catchments in a temperate stream network. The carbon exported by streams and rivers corresponds to 2.7 % of the terrestrial NPP. CO2 evasion and downstream transport contribute about equally to this flux. A review of existing studies suggests that the catchment-specific carbon export varies in a relatively narrow range across different study regions and spatial scales.